Description: Slender, tufted perennial to 0.5 m high, with thickened, pubescent or hirsute base; culms few-noded, simple or sparsely branched, disarticulating at all nodes. Leaves with blade involute, to 3 mm wide, densely pubescent, sometimes also pilose to hirsute, disarticulating at junction with sheath. Panicle spicate, 2–14 cm long, 0.5–1.5 cm wide (including awns); reduced panicles and solitary cleistogenes present in the lower and upper axils. Spikelets 3- or 4-flowered, 1 fertile. 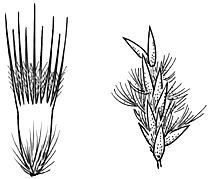 Glumes 3–7 mm long, 4–8-nerved, obtuse, erose or entire, muticous or mucronulate. Body of basal lemma c. 1.5–2 mm long, 9–11-nerved, nerves ribbed; awns 2–5.5 mm long, plumose in the lower 50–70%. Palea membranous, slightly longer than the lemma. Distribution and occurrence: Grows in open country, often on sandy or loamy red soils.